Jacob Henry Enns: pastor, farmer, cabinetmaker; born 23 October 1913 in Teddington near Nipawin, Saskatchewan, Canada to Jacob J. Enns (13 May 1887, Neuendorf, Chortitza Mennonite Settlement, South Russia - 25 December 1968, Lost River, Saskatchewan) and Helena (Heppner) Enns (28 October 1881, Manitoba, Canada – 1917, Saskatchewan). He had two brothers, Peter and Karl. Jacob’s brother Karl and his mother Helena died when Jacob was about four years old. His father married Margaretha Neufeld (1897-1984) and Mary, John and Clarence were born to the family. In 1935 Jacob married Helen Bergen and the family was blessed with five children: Arnold, Evelyn, Carl, Dan, and Neta. Jacob passed away suddenly in a car accident on 31 March 1979 in Skookumchuk, British Columbia, Canada. Jacob became a follower of Jesus in his late teens and was baptized in the Bethany Mennonite Church in Lost River, Saskatchewan in 1934. Jacob’s pulpit ministry began in 1938 when his home church recognized his gifts and calling and he was ordained in the church at Lost River, the same church that his father Jacob J. Enns pastored from 1919 until 1945. 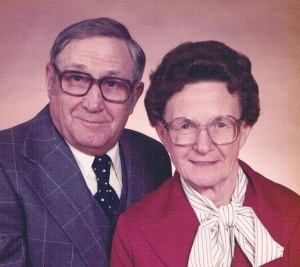 Jacob recognized his need for more formal theological training and supported himself and his family as he studied at Briercrest Bible Institute at Caronport, Saskatchewan in 1951. Enns pastored and farmed at Lost River until 1955 when the family moved to Kelowna, British Columbia (BC) where he soon became actively involved as one of the pastors at First Mennonite Church. In 1960, together with John P. Vogt, Jacob led in the establishment of Kelowna Mennonite Mission Church, which was later renamed Kelowna Gospel Fellowship. Jacob’s vision for the congregation was to see the children and youth taught in the Scriptures and for the church to be a light to the community that bridged cultural barriers. Enns served the church for most of the next 16 years without remuneration so that a large part of the finances could be used for missions. During those years many missionaries were supported by Kelowna Gospel Fellowship Church. Enns was also very involved in the local ministerial association and had the opportunity to be involved with local evangelistic crusades and attended the Billy Graham School of Evangelism. He also continued to support Briercrest Bible College as a member of the Advisory Board. The heart of Jake’s life was Christ’s church and he gave much of his time and effort to counseling, preaching, and leading the local church. He believed that the true church was much bigger than an organization or denomination and contributed his efforts to many interdenominational mission organizations as well as to the mission and relief work of the General Conference Mennonite Church. Jacob was a skilled cabinetmaker as well. He used this skill to support his family and had many opportunities to share his faith on the job. Jacob always made time for his family even though he spent many hours serving the church, and his family and wife Helen were an anchor for him during stressful times that inevitably came in the work of pastoring. Family times included a lot of laughter and outdoor adventures. His love of nature often led him to spend time in God’s creation where Jacob felt he could really worship and commune with his Heavenly father. Jacob H. Enns was a mentor to many young people who felt called to serve God in full time Christian service. When he felt that it was time for the church to call a paid pastor he encouraged Ron Daku to become the first full time pastor at Kelowna Gospel Fellowship. Jacob’s vision for the church continues in a thriving church that continues to hold to the same mission, vision, and values that Jacob Enns promoted when it began 50 years ago. Enns, Carl. "Enns, Jacob H. (1913-1979)." Global Anabaptist Mennonite Encyclopedia Online. June 2011. Web. 24 Apr 2019. http://gameo.org/index.php?title=Enns,_Jacob_H._(1913-1979)&oldid=156655. Enns, Carl. (June 2011). Enns, Jacob H. (1913-1979). Global Anabaptist Mennonite Encyclopedia Online. Retrieved 24 April 2019, from http://gameo.org/index.php?title=Enns,_Jacob_H._(1913-1979)&oldid=156655. This page was last modified on 8 February 2018, at 14:40.